Loomis Dean Photography Vintage Editorial Stock Photos Restaurant staff incl. chefs & waiters carrying trays of food as they ride up & down on the escalator from the 2-story kitchen of the Rotterdam Hilton Hotel. Restaurant staff incl. chefs & waiters carrying trays of food as they ride up & down on the escalator from the 2-story kitchen of the Rotterdam Hilton Hotel. Title Restaurant staff incl. chefs & waiters carrying trays of food as they ride up & down on the escalator from the 2-story kitchen of the Rotterdam Hilton Hotel. Description Restaurant staff incl. 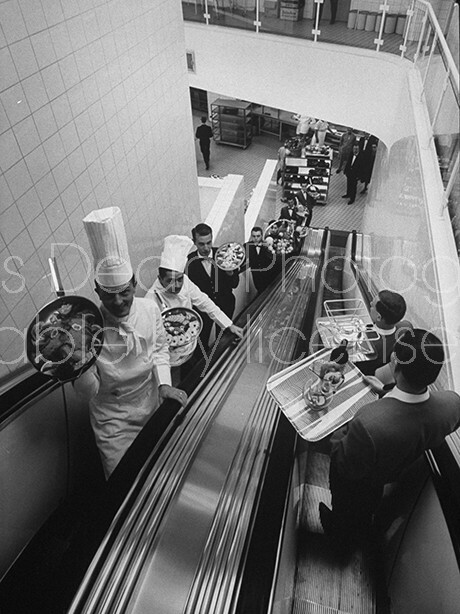 chefs & waiters carrying trays of food as they ride up & down on the escalator from the 2-story kitchen of the Rotterdam Hilton Hotel.